Distortion At Mixdown: Distortion can work wonders for adding body and sustain to percussion. Take this kick drum, for example (Ex12.01:WAV/MP3 ), and hear how its tone and length can be enhanced by judicious parallel distortion processing without any risk of the drum 'breaking up' (Ex12.02:WAV/MP3 ). For pitched instruments, distortion can have many uses at mixdown. For bass, it can add mid-range emphasis so that the sound carries through better on small speakers, as in this example (without distortion Ex12.03:WAV/MP3 ; with distortion Ex12.04:WAV/MP3 ). For soft-sounding electric guitar tones like this (Ex12.05:WAV/MP3 ), there's only so much you can harden up the tone with EQ -- this is about the best I could do (Ex12.06:WAV/MP3 ). Adding in controlled distortion, however, is much more successful (Ex12.07:WAV/MP3 ). Rock lead vocals often benefit from some distortion to help them overcome the powerful masking effects of dense and distorted instrumental textures. Take this lead vocal, for example (Ex12.08:WAV/MP3 ). Although it has plenty of high-frequency definition on its own, once it's in the mix (Ex12.09:WAV/MP3 ) it seems veiled and lacking presence. Adding extra high-frequency density to the sound with a parallel distortion effect makes the voice sound a bit crunchy in solo (Ex12.10:WAV/MP3 ), but clearer and closer within the mix as a whole (Ex12.11:WAV/MP3 ). When using parallel distortion, however, you need to be careful that the distortion contribution doesn't cause undesirable phase-cancellation with the undistorted sound, as in the following example. The lead vocal from this Mix Rescue was short on aggression and midrange density (Ex12.12:WAV/MP3 ), but adding in a promising-sounding parallel distortion effect initially made the sound boxy in a really nasty way on account of unfavourable phase-cancellation (Ex12.13:WAV/MP3 ). Simply phase-rotating the distortion return channel gave a much more useful tone (Ex12.14:WAV/MP3 ), without any change whatsoever to the parameters of the distortion effect itself. Programmed Subsynths & Doublings At Mixdown: Let's say that you decide this bass-guitar sound is lacking in low end (Ex12.15:WAV/MP3 ). One option would be to apply a subharmonic synthesizer effect of one sort or another, but in my experience more predictable results are usually delivered by programming a complementary subsynth line (Ex12.16:WAV/MP3 ) which can be combined in a carefully controlled manner (Ex12.17:WAV/MP3 ). Notice that although the synth's artificial nature is clearly apparent when it's soloed, it nonetheless melts inconspicuously into the mix as part of the composite bass-guitar sound. Adding a subsynth patch underneath an existing bass part isn't necessarily just about frequency information, though, because it can also be used to add rhythmic impetus, as in this example: without subsynth (Ex12.18:WAV/MP3 ) and with sub-synth (Ex12.19:WAV/MP3 ). Furthermore, doubling bass lines with MIDI sounds in a higher register also has its uses for filling out the line's apparent mid-range tone, as in this example where a distorted and flanged MIDI clavinet sound is being used: here's the mix without the doubling (Ex12.20:WAV/MP3 ) and with the doubling (Ex12.21:WAV/MP3 ). Reamping & Overdubbing At Mixdown: Software reamping can be very useful for replacing inappropriate bass-amp sounds. For instance, the bass DI signal (Ex12.22:WAV/MP3 ) from this Mix Rescue project, sounded fairly promising with just a little EQ, compression, and ambience. However, the raw recording of the bassist's amp (Ex12.23:WAV/MP3 ), while not obviously broken-sounding, nonetheless wasn't adding anything very useful in terms of low end or sonic character when combined with the DI (Ex12.24:WAV/MP3 ). Experiments with EQ failed to unearth a more appealing tone, so I reamped the DI signal instead (Ex12.25:WAV/MP3 ), which yielded a much more successful combination (Ex12.26:WAV/MP3 ). Reamping can also be used to supplement guitar parts by adding new tonal layers, as in the following Mix Rescue example. Here's a mix of the supplied bass-guitar and double-tracked rhythm guitar parts (Ex12.27:WAV/MP3 ). Because the rhythm guitar had been overdriven too much, mix processing wasn't able to give the sound any character or improve the note definition. Fortunately, a DI feed from the guitars had also been recorded during tracking, so I was able to layer in two reamped parts (Ex12.28:WAV/MP3 ; Ex12.29:WAV/MP3 ) to achieve a much more satisfactory tonal transformation, as you can hear when all the parts are mixed together, along with an additional subsynth part I programmed to fill out the low end (Ex12.30:WAV/MP3 ). One final Mix Rescue reamping example, this time in a full-mix context: here's the mix without any reamped additions (Ex12.31:WAV/MP3 ) and with the reamped layers added (Ex12.32:WAV/MP3 ). Where reamping is not an option for whatever reason, you can still pull similar stunts by surreptitious overdubbing, as in the following example from this Mix Rescue project. Here's the original double-tracked guitar recording (Ex12.33:WAV/MP3 ), which has once again lost note definition by being too heavily overdriven during recording. 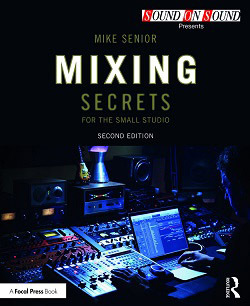 A stiff dose of mix processing improves things a little (Ex12.34:WAV/MP3 ), but adding in a simple double-tracked overdub part (Ex12.35:WAV/MP3 ) is able to take the combined tone much further (Ex12.36:WAV/MP3 ). Triggering Samples At Mixdown: Some subharmonic synthesizer plug-ins can add weight to drums quite successfully, as in this example where a kick drum (Ex12.37:WAV/MP3 ) is processed with the 50HzKicker algorithm in Cockos's freeware ReaJS plug-in to add a rhythmic 45Hz low-frequency sine-wave pulse (Ex12.38:WAV/MP3 ). Combining the two gives a heavier and lengthier end result (Ex12.39:WAV/MP3 ). However, because subharmonic synthesizers can be a bit fickle in how they respond, I usually prefer filling out drum sounds by layering additional samples alongside. So when presented with the task of adding attack and weight to the kick drum (Ex12.40:WAV/MP3 ) within this Mix Rescue project, I chose instead to layer in a carefully selected sample (Ex12.41:WAV/MP3 ), easily achieving a much more useful combined tone than any mix processing would have been able to achieve (Ex12.42:WAV/MP3 ). Your choice of additional sample in each case naturally depends on what elements the supplied drum sound is lacking, so (by way of contrast) in this Mix Rescue, for example, where the supplied kick drum (Ex12.43:WAV/MP3 ) required additional midrange cut-through, I actually decided to layer an extra snare sample over it (Ex12.44:WAV/MP3 ), resulting in this composite timbre (Ex12.45:WAV/MP3 ). Added samples aren't just something for adding to kick drums either, because snares are often replaced, and even percussion can sometimes be usefully supplemented in this way, as in this Mix Rescue remix, which had a rather limp-sounding hi-hat part (Ex12.46:WAV/MP3 ). Layering in a simple programmed hi-hat part with a more assertive sound (Ex12.47:WAV/MP3 ) gave a combined part with much more rhythmic impetus and solidity (Ex12.48:WAV/MP3 ). Pitch-shifting For Tonal Change At Mixdown: Here's an example from this Mix Rescue of changing the tone of a part using pitch-shifting. Although the original synth track in this case sounds like it would cut through the mix fine on its own (Ex12.49:WAV/MP3 ), in fact it was struggling to make its presence felt because of masking from other more important parts in the arrangement. My solution was to mix in a pitch-shifted upper octave (Ex12.50:WAV/MP3 ), relocating the sound's energy into a higher register and thereby side-stepping most of the masking issues. Synth Pads At Mixdown: Synth pads are a lot more use at mixdown than a lot of people think, and the crimes of the 1980s are no reason to ignore the usefulness of this production technique. For a start, traditional block-chord pads can add subtle warmth and richness to a mix, even if you mix them in at a level where they can't be heard in their own right. Take this Mix Rescue, for instance. Here's a section of the mix without any pad (Ex12.51:WAV/MP3 ). Adding this pad (Ex12.52:WAV/MP3 ) doesn't make the full mix (Ex12.53:WAV/MP3 ) sound like it has a synth in it -- it just makes the guitars and bass feel fuller and more sustained. Even acoustic music that isn't normally associated with synths can be enhanced in this kind of way if the pad synth is programmed and mixed sensitively. For this Mix Rescue, for instance, I wanted to add extra warmth and sustain to the guitar, so one of the things I did was introduce this very subtle pad (Ex12.54:WAV/MP3 ), changing this mix sound (Ex12.55:WAV/MP3 ) to this mix sound (Ex12.56:WAV/MP3 ). Pads needn't just be about adding sustain, either, because you can easily enhance rhythmic parts too, as I did for the guitars in this Mix Rescue. The reason I did it was that the guitar tone had been distorted too much, and I wanted more 'note' to the sound. Adding this pad (Ex12.57:WAV/MP3 ), enabled me to change the combined sound from this (Ex12.58:WAV/MP3 ) to this (Ex12.59:WAV/MP3 ), effectively reducing the level of guitar distortion by adding extra 'note' synthetically. And I'd challenge anyone to spot that there was a synth in there without knowing about it beforehand -- the band certainly didn't! Sometimes, though, it can still make sense for a synth pad to be audible, especially when it can supply additional stereo interest. For example, here's a synth part (Ex12.60:WAV/MP3 ) I added during this Mix Rescue remix. Here's what the texture sounded like before (Ex12.61:WAV/MP3 ) and after (Ex12.62:WAV/MP3 ). A Combination Of These Techniques In Practice: This particular Mix Rescue required several of the above techniques working together in order to achieve a fuller sound, as you can hear in this file (Ex12.63:WAV/MP3 ). Now let's progressively strip away all the added layers, so you can hear the extent of their contributions: some sample-library guitar parts (isolated Ex12.64:WAV/MP3 ; mix without Ex12.65:WAV/MP3 ); a synth pad (isolated Ex12.66:WAV/MP3 ; mix without Ex12.67:WAV/MP3 ); a simple rhythmic electric-piano part (isolated Ex12.68:WAV/MP3 ; mix without Ex12.69:WAV/MP3 ); a selection of different cymbal samples (isolated Ex12.70:WAV/MP3 ; mix without Ex12.71:WAV/MP3 ). Affordable Distortion Plug-ins: Lots of PC-only freeware delights here: GVST GClip (which I use to death!) and GRect ; Togu Audio Line's freeware TAL Tube ; Variety Of Sound's FerricTDS 32-bit, TesslaSE 32-bit, and TesslaPRO 32-bit; Silverspike RubyTube 32-bit; Tin Brooke Tales TLS Saturated Driver 32-bit; the various versions of Fretted Synth FreeAmp 32-bit; Aradaz Crunch, White & Green Amps 32-bit; AcmeBarGig's range of freeware plug-ins 32-bit; and SimulAnalog Guitar Suite 32-bit. Some good cross-platform options include Mda's unassuming little Combo 32-bit; Voxengo's freeware Tube Amp and Boogex ; Melda's freeware MWaveShaper ; Stillwell Audio's affordable Bad Buss Mojo ; and ToneBoosters's affordable TB Ferox (an updated version of Jeroen Breebaart's renowned freeware Ferox tape emulation). Affordable Exciter Plug-ins: The best freeware I've found so far for emulating the high-frequency enhancement effects of the Aphex Aural Exciter are Greenoak's freeware Excitifier 32-bit and the two Exciter algorithms in Cockos's freeware ReaJS . However, Elogoxa's freeware X-Cita 32-bit is also good, especially for smoother-sounding settings. Affordable High-speed Modulation Plug-ins: Any modulation plug-in with a higher-than-20Hz modulation rate will generate additional harmonics, but my top tips here are U-he's affordable Uhbik series and Melda's freeware MFreqShifter and MRingModulator , which should give you more options than you'll ever need. Affordable Pitch-shifting Plug-ins:: One of the best freeware options I've found for achieving tonal tweaks is Bitterspring's freeware 4 Band Shifter 32-bit. Most DAW platforms now have general-purpose shifting built in, but if not then consider trying out the low-cost Cockos Reaper DAW, which includes the ReaPitch plug-in as standard. Affordable Subharmonic Synthesis Plug-ins: I've yet to find a really great subharmonic synthesizer plug-in as freeware, although Mda SubSynth 32-bit and the 50HzKicker algorithm in the Cockos freeware ReaJS plug-in have both proved useful on occasion. Waves Lo Air is better, and pretty affordable, but personally I still prefer in general to double bass parts with a dedicated MIDI subsynth patch wherever I can. Affordable Drum Triggering: For simple triggering applications, the Cockos freeware ReaGate will do fine, while Koen Tanghe's more complicated freeware KTDrumTrigger 32-bit allows more performance nuance to pass into the MIDI data. If these don't do the trick, then you'll probably want to invest in some commercial software: Slate Digital Trigger , SPL DrumXchanger , and Wavemachine Labs Drumagog are all well-respected and include a selection of built-in samples. If you're looking for free samples, there are lots available from the Freesound Project. For commercial drum samples, check out the Time+Space and Sounds Online sites in the first instance. On-line Session Musicians: If you need an overdub to supplement your arrangement, but don't have access to suitable instrumentalists or recording equipment/venues, then it's well worth checking out some of the on-line session musician services that are now available. Three of them were compared in this article, which includes audio examples of what each managed to achieve on the same demo song. I also used one of the most well-known services, StudioPros, when supplementing the guitar parts in this Mix Rescue article, which again includes a number of audio files. Using Synth Pads: Learn more about the applications of synth pads here. For a comprehensive overview of sound synthesis in general, check out Gordon Reid's gargantuan Sound On Sound 'Synth Secrets' article series. Non-EQ Tonal Adjustments In Practice: These two Mix Rescues (article 1, article 2) provide real-world examples of a lot of different tonal techniques beyond EQ.